The thermal imaging device can be used to track human forms within a smoky room or even track fleeing suspects in the woods. GALLIPOLIS — The Gallipolis Volunteer Fire Department recently acquired two thermal imaging cameras after purchasing them through funds acquired through an earlier bingo night. Firefighters commonly cannot see when entering a building filled with smoke. 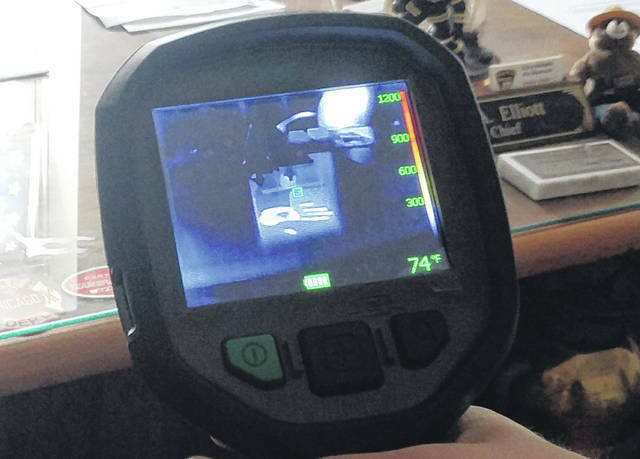 Gallipolis Firefighter Josh Staley explained that if an individual had crawled on their hands and feet within a recent time frame, the camera could also pick up the heat signature in the form of handprints and footprints. Both Elliot and Staley said the units they possessed could capture video of images and connect them with a smartphone to allow tactical movement between firefighting units. The cameras are of the FLIR K65 series. The department previously had another thermal imaging unit from several years ago. Elliot said the previous unit was so old however that chargers and batteries utilized by the previous unit were no longer made and difficult to find. Staley said law enforcement utilized such cameras when searching for individuals in the dark or to tracking a suspect’s footprints. The cameras could also be utilized to discover remaining hotspots in a structure in hopes of preventing fire rekindlings and thus another trip by the fire department to a burn site and the hazards included with that.